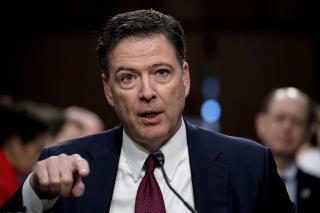 (Newser) – If lawmakers really want to know the truth behind the Brett Kavanaugh allegations, giving the FBI only a week to conduct an investigation is "idiotic," James Comey writes in a New York Times op-ed—but he has faith in the agency's abilities. "If truth were the only goal, there would be no clock, and the investigation wouldn’t have been sought after the Senate Judiciary Committee already endorsed the nominee," the former FBI director writes. "Instead, it seems that the Republican goal is to be able to say there was an investigation and it didn’t change their view." He calls the process "deeply flawed, and apparently designed to thwart the fact-gathering process," but says, "The FBI is up for this. It’s not as hard as Republicans hope it will be." The US people don't want the truth, just to get on with their selfish way of life. Comey, why don't you make Bill and MOST of the Country happy and run away with HRC never to be seen or heard from again ? On second thought maybe the rabid Pelosi and Blumenthal or Chuckie S would like to go with ! comey is Idiotic...why does he still have a job with the fbi and not cnn or the clinton foundation?